Located just inside the village line, this property offers easy drive up storage rooms with 24/7 access controlled by a computerized gate. The sizes range from a small walk-in closet to a two car garage, making it the perfect choice for people who are moving, businesses that are growing or anyone that needs a little extra space. Convenient to Maybrook, Montgomery, Newburgh and Middletown. 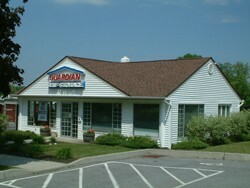 Next door to Newburgh Auto Glass, just inside the village line on Route 208.